Melanie is enthusiastic about the growing prospects and opportunities of various industries and writing articles on consumer goods and services as a freelance writer. She writes extensively for internet service providers and also topics related to internet service providers in her area for presenting the consumers, the information they need to choose the right Internet package for them. If you are a fan of Open Wonderland, then you know how helpful it is to start your world building project with existing 3D models. Since Open Wonderland uses 3D models in .kmz (Google Earth) or .dae (COLLADA) formats, compatible file downloads can be difficult to find, especially ones you don’t have to shell out big bucks for. Most Open Wonderland users are familiar with the Google 3D Warehouse, but there are other sites that also offer 3D models for free. Open Wonderland scene with objects from 4 sites. For example, in the image above, the Japanese Vase comes from the Google 3D Warehouse, the Miss Lacy Chairs from 3DVia, the Couch from OurBricks and the Tennis Racket from TurboSquid. Some of the sites have more variety than others, and some of the sites have some great models, but not in compatible formats. For those, you can often use the models if you can convert them. For educators, Autodesk makes all of their 3D modeling tools available for free from their Autodesk Education Community site, so even if you don’t know how to use those tools, it’s not too difficult to learn enough to convert from one file format to another. When browsing these sites, keep in mind that for a real-time environment like Open Wonderland, you will get the best performance with models under 2MB. Google 3D Warehouse – The accompanying website for Google SketchUp where modelers can upload, download and share three dimensional models. When you have access to this, you have access to tons of free 3D models. OurBricks – This is a small but growing site with almost all models in COLLADA format. One unique feature of this site is that it supports animated COLLADA models, some of which work well in Wonderland. TheFree3DModels–This site offers a variety of free 3D models in various formats. You can’t use the search box to find ones that are compatible with Wonderland. They are out there, however. You’ll have to scroll through the listing to find them, though all models are clearly labeled with file types, which helps. 3DVia–This site requires you to sign up, but it is still free. You can download various 3D models, made by people like you. You can also upload your models, so that you can access them anywhere and share them with others. It is super easy to search by file type, which is a huge plus! They also have a very large selection to choose from. TurboSquid–This site has 3D models you have to pay for plus free ones. The search for free brings up over 7800 results, so the selection is good. Finding compatible formats is a little harder. There is no good search for them, so you will just have to look manually. The format types are listed in the thumbnails, however. If you do opt to pay for a model, TurboSquid will convert the model to .dae for no extra charge. Exchange3D–This site is also a mix of free and pay 3D models. The bad thing is that you can’t search for just the free ones. You have to hunt them down. The good thing is that you can search for the format types. At least it is some help. No matter what type of 3D model you are looking for, someone out there has probably made it. Save time and energy by taking a few minutes to search these six websites. Maybe you can find a free model to use. If not, remember to share your creations with the world, and help out other fans of Open Wonderland. You can contact Melanie at slaugh.slaugh907 @ gmail.com. Some time ago, I described work on an Open Wonderland webcaster that had been undertaken by one of our students at the University of Essex. One of the motivations behind the Webcaster was to provide access to those users who merely want to observe (and listen to) the activities in an Open Wonderland (OWL) virtual world instead of actively participating. In particular, we wanted to enable access to a set of users in the +Spaces project, such as policy makers, who wish to watch a session in which a policy is debated or acted out in a role play simulation and not be able to influence the session. Since the first video-only version of the Webcaster, we’ve experimented with several different approaches to extend the Webcaster to provide audio, one of which is described below. After several unsuccessful attempts, we now have a successful prototype implementation that combines the video broadcast functionality with an existing OWL virtual phone object to provide a unified audio-video webcast. The video above shows the OWL webcaster being used by two clients. One client is a regular OWL webstart client, into which a Webcaster ‘object’ has been inserted. The following ports must be open on the server host (and accessible through a firewall): 5080 and 1935. The Webcaster requires further testing with more concurrent users before release to the OWL module warehouse–we’ll post a message on the forum when it’s ready. However, as ever, the source code is available in the unstable directory of the wonderland-modules SVN repository. In this section I’ll briefly describe the video-only webcaster, the failed experiment at combining audio and video, and an idea for how the current implementation could be improved. The video functionality of the webcaster requires a full OWL client to capture the graphics rendered by the in-world webcaster ‘camera’. The captured graphics are transmitted to a Red5 RTMP Server that is likely running on the same host as the OWL server. From there, lightweight clients can connect to receive a Flash ‘stream’ to play in a Flash player (or Web browser plugin). 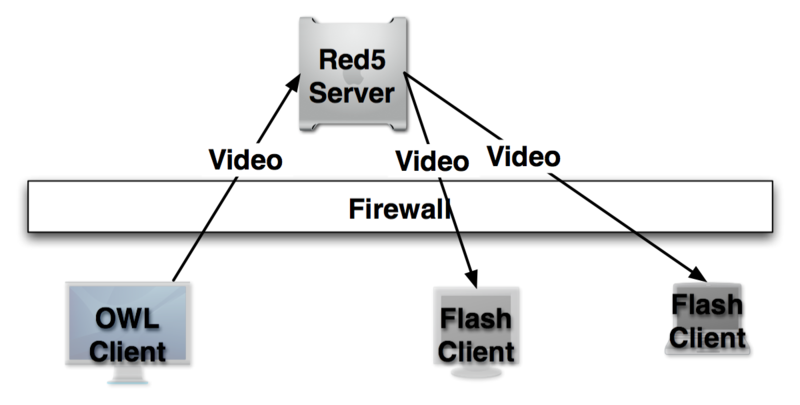 In this case, the firewall has to be configured to enable the OWL client to transmit graphics to the Red5 server, as well as for Flash clients to stream from the Red5 server. This architecture is represented by Figure 1 below. The OWL Client receives audio from the voicebridge that it plays through the client’s audio-out drivers, such as its speakers or a headset. 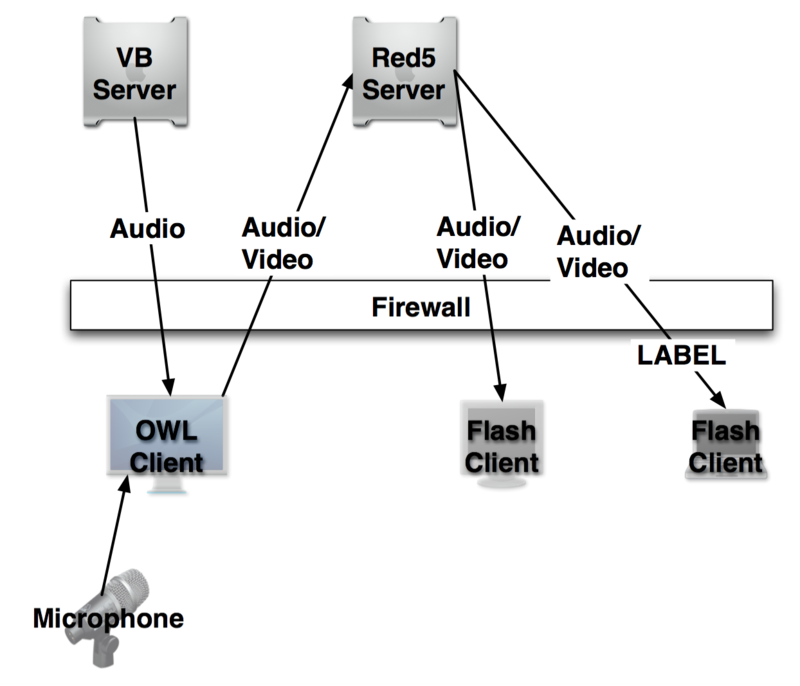 The audio it receives is attenuated/spatialised according to the location of the avatar that is associated with the user of the OWL client, but does not include the audio from the microphone connected to the hardware on which the OWL client is running. Our attempt to combine audio and video on the client first required us to mix the audio from the voicebridge with the audio from the client microphone and then combine that with the captured graphics, before sending it on to the Red5 server. From that point, the Flash clients would be ignorant of the change in architecture and would receive a combined audio/video ‘stream’ to play. This architecture is represented in Figure 2 below. The audio was received from the perspective of the avatar of the user associated with the client, NOT from the perspective of the webcaster object in the virtual world. The frequency of the received audio could be changed by the user, which made mixing with the audio from the microphone unstable. The extra processing that was required on the OWL client to mix the audio and then combine with the graphics was significant. Thus, this approach was abandoned as infeasible. An alternative approach: to mix the audio on the voicebridge before sending to the OWL client was also considered. This suffered from the drawback that there was no existing mechanism to send the mixed audio to the OWL client–it would have required an additional connection through a firewall. Again, this was abandoned due the problems of managing ad hoc connections. The current approach works around the audio problem by using an existing virtual phone object. However, we recognise that it is less than an elegant solution–we would still like to be able to provide a combined audio and video Flash stream to Web Browser clients. Ideally, we’d like the architecture as illustrated in Figure 3. Here the video is sent from an OWL client to the Red5 server where it is mixed with the spatialised audio that comes from the voicebridge, from the perspective of the webcaster. We have no idea if this would be possible, as it requires expertise in developing Red5 applications. However, if any readers would like to take this on as an experiment, please reply via a comment below. Or, if you have experience of Red5 and think this is a daft idea, let us know via the comments! In earlier blog postings about the +Spaces project, Bernard described how we were using Open Wonderland (OWL) to host polls and debates, so that citizens could express their views on potential government policies. In this posting, we will describe another mechanism to encourage citizens to engage in the policy-making process: role-play simulations. Role-play has been used for many purposes such as predicting outcomes, war-gaming, team building, and training. It has been particularly useful as a teaching tool in the classroom, allowing students to act out and experience some of the dynamics of a particular problem or issue, from different stakeholder perspectives. Aspects of role-play have also been used in online environments such as virtual theatre, gaming, and focused discussion forums. Role-play simulations in virtual worlds have often been labelled as ‘serious games’, often used where it would be too dangerous or too costly to attempt the activity in a real-world setting. Examples include safety training on oil rigs, and educating paramedics. Many of the examples of role-play simulations are custom-built virtual worlds (such as the examples above). However, one of the requirements of the +Spaces project is to come up with an abstract description of role-play simulations that could be used in multiple policy domains, so that the +Spaces functionality could be used to address policies across a range of domains. The idea is that users can consider the consequences of a proposed policy through a role-play simulation. An online moderator facilitates the session, assigning users to roles specific to the role-play. The users are then guided through the stages of the role-play simulation by the moderator. The template can be instantiated with a description of the policy, useful web links, descriptions of roles, and questions to be answered by the participants. We implemented the two templates in OWL, and the video below shows a much-shortened version of the first trial that took place recently, using an instantiated Depolarizer template. You’ll see that the moderator (Michael) has a control panel from which he can step through the stages in the template, whereas participants (such as Bernard) do not have access to the control panel. The other users in the trial were students from the University of Essex. The participants felt that the process worked very well. They thought that it was clear what they were meant to be doing at each stage. They particularly liked the icebreaker stage as a way of getting into the subject. The carpet vote also worked well. Some of them preferred the experience of the role-play to their experience of taking part in the previous OWL debate pilot. Because the process was much more structured they felt it was easier to follow than the debate – it was easier for the users to participate in the activities because they had a clear idea of what they should be doing at each stage – they felt that they could participate more easily. Although the Depolarizer is quite a simple role-play compared to the Galactic Wormhole, they all found the optimist/pessimist roles to be very easy to get into. The functionality of the simulation worked well, although there were some issues with the size of the statements on the “statement wall” and the location of some of the elements of the virtual world. Videos are also available that provide an (edited) full-length version of the trial, as well as a (very short) video of the OWL features that we implemented. We’d be really interested in your responses to this approach to simulation and also other possible applications, such as directed learning. You are currently browsing the Wonderblog blog archives for May, 2012.